Jon Reiner, obeying Nabokov's command, has given full voice to his memory in The Man Who Couldn't Eat, the story of his ongoing struggle with chronic Crohn's disease. Can you imagine what it would be like to not be able to eat or drink? No sweet chocolate goodness. No salty fried deliciousness. Not even the OK tastiness of fruits or vegetables. Reiner's sharp wit is powerful and authentic. "An exquisite interweaving of the intense pleasure of eating along with the intense suffering that results when his body rebels." The Man Who Couldn't Eat is Jon Reiner's candid memoir about living with Crohn’s disease. Jon, like most of us, loves food. Yet as he lives with this illness, his life is changed in many ways and the wrong foods can be his body's worst enemy. "Reiner is a great storyteller, and as I read his story I was totally swept in." In The Man Who Couldn’t Eat, Jon Reiner recounts his months without eating as a result of Crohn’s Disease. In the process of reflecting on what life means to him without food, he also examines his marriage and the role that food played in his childhood. "Reiner gives the reader a window into his life." The Man Who Couldn't Eat is Jon Reiner's personal story about returning home from an uneventful grocery shopping trip only to have his stomach explode. As he struggles to heal after a poorly performed surgery, he is put on TPN. He is sent home to spend months living without eating or drinking - absolutely nothing by mouth. His deep surgical wound is left open and covers his gut. The battle to survive takes Jon on an emotional roller-coaster through denial, anger, depression, and finally acceptance. The book chronicles a full year of medical drama, yet it is so much more than the tale of one man's struggle to survive. "One man's conquest to discover the yin and yang of life through his stomach." Most of us are able to enjoy and even sometimes have taken for granted our senses but what if for example one of it has been taken away like our sense of taste or even worst what if we can’t eat at all? This happened to author Jon Reiner who accounted his plight into pain and not being able to eat as he chronicled his life in the novel The Man Who Couldn’t Eat. "This is a triumphant book." 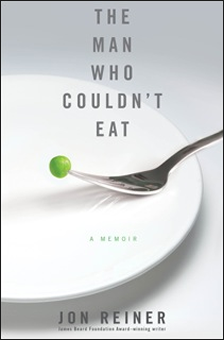 I have written previously about Jon Reiner and his book, The Man Who Couldn’t Eat. I was especially thrilled to have the opportunity to see him at a reading, shake his hand and speak with him for a few short moments. I also took home a signed copy of his book that night. It took a while for it to make its way up to the top of the pile, but it finally did a week or so ago. I finished it today, and am tempted to read it again!
" An exploration of the fundamental tenets of humanity." The thought of not being able to eat or drink for months on end is disturbing enough. But in the case of Jon Reiner, this predicament of taking “nothing by mouth” is the only solution his doctors come up with when his Crohn's disease almost kills him. "Reiner dissects his life with penetrating honesty and humor."